The organizers of this weekend's free Repair Café want to shake people out of the mindset that they have to toss out anything that's broken — and pass along the skills to fix things, too. Maybe it's a bucket with a wonky handle, a computer hard drive with a mysterious malady, or simply a ragged pair of jeans. Regardless of what needs fixing, the Ottawa Tool Library is promising help will be on hand this Saturday. 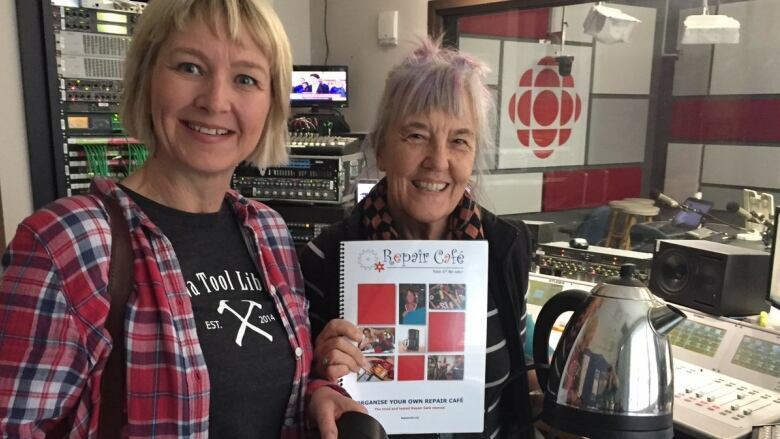 The local not-for-profit is hosting its inaugural Repair Café at its headquarters inside the City Centre building. "We have people who can help you with furniture items, anything with carpentry, small appliances like kettles or toasters [that] are not working any more, computers, textiles, sewing, leather," said Bettina Vollmerhausen, the library's co-founder. "We hopefully have — for a first-time [event] — covered a lot of bases. And we'll see how it goes." Vollmerhausen and library volunteer Marit Quist-Corbett, told CBC Ottawa's All In A Day that part of the motivation behind Saturday's event is to shake people out of the mindset that they have to toss out anything that's broken. They also want to pass along some basic repair skills. "We want to teach how to do it. If it can't be done, we also hope that we can say, 'Look, come back another time, or go and see this person,'" said Quist-Corbett, sitting in front of her own busted kettle. "There are lots of people who are willing to give their time, who are passionate about keeping things out of the landfill." "Not many people fix things any more," added Vollmerhausen. "They just go, 'Oh, it's only 20 bucks. I'll just buy another one, whatever.'" The free event — which also includes coffee and cookies, as befits its designation as a café — runs from 11 a.m. until 4 p.m. at 250 City Centre Ave., bay 216.